You can neither lie to a neighborhood park, nor reason with it. 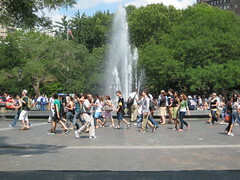 “Artist’s conceptions” and persuasive renderings can put pictures of life into proposed neighborhood parks or park malls, and verbal rationalizations can conjure up users who ought to appreciate them, but in real life only diverse surroundings have the practical power of inducing a natural, continuing flow of life and use. Superficial architectural variety may look like diversity, but only a genuine content of economic and social diversity, resulting in people with different schedules, has meaning to the park and the power to confer the boon of life upon it. 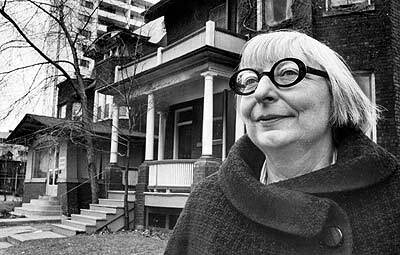 More on Jane Jacobs as author, community activist, and urban planner from WSP Blog here. More on Phase II tomorrow. In 2009, graphic designer Mike Joyce created these postcards, “More Jane Jacobs, Less Marc Jacobs,” and proceeded to spread the word about them. He provided them to anyone who requested them and they were placed in coffee shops and other locales around town. The postcards are still visible as seen here last month at West Village spot Soy Cafe. One, it is absolutely not meant to be a personal statement against Marc Jacobs. I actually like some of the store’s window displays and think he and his team are really talented designers. And two, don’t be so literal! It’s a play on words to reflect the Village being taken over by franchises and chains of all kinds–not just the six Marc Jacobs stores. Oh, that would be my third point, there is of course a place for Marc Jacobs in the Village but six stores on two blocks?! Come on, the person that argues for that has no individuality. Freddy’s Brooklyn Roundhouse is a well-produced “non-corporate media” outlet, viewed on MNN (Manhattan Neighborhood Network), BCAT (Brooklyn Community Access Television) and YouTube, covering topics such as The Atlantic Yards, media consolidation, Eminent Domain abuse, as well as changes linked to (over) development in NYC. The program is airing a two part show from September 22nd’s Jane Jacobs event organized by Reverend Billy and held at Judson Memorial Church across from Washington Square Park. The Death and Life of Great American Cities, Jane Jacobs’s most famous book, helped change the blind acceptance of urban planners and their grand schemes to remake cities into unlivable places. 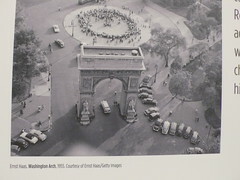 Jacobs ended Robert Moses’ reign of bad building and urban destruction. With the misguided development of the Bloomberg administration today, Jane Jacobs’s work is as important as it ever was. Freddy’s Brooklyn Roundhouse presents two new episodes based on readings from Jane Jacobs, filmed at the Judson Church, NYC and hosted by Green Party Mayoral Candidate Rev Billy. Episode 1: Features neighborhood activists, Michael Premo from Picture the Homeless, Philip Dipaolo from The People’s Firehouse and Joy Chatel, Defender of the Duffield House Brooklyn Underground Railroad landmark. Episode 2: Features neighborhood activists, Cathryn Swan of the Washington Square Park Blog and Save Union Square, Melanie Joseph of the Foundry Theatre and Christabel Gough, NYC preservationist hero. Bob Holman, of the Howl Festival & Bowery Poetry Club and former City Councilwoman, Carol Greitzer, are other activists who spoke at the event and were not included in the above shows, due to lack of time, but can be found here. You can watch Freddy’s Brooklyn Roadhouse weekly Tuesdays at 8 p.m. on BCAT and Thursdays at 8:30 p.m. on MNN. Episodes are then also uploaded to YouTube. Episode 1 aired this week but Episode 2 will air next week at the following times and places: BCAT Tuesday Oct 20, 8 p.m., TimeWarner Cable(Ch. 34)/Cablevision(Ch. 67)/RCN(Ch. 82)Verizon(Ch. 42) and on MNN Thursday Oct 22, 8:30 p.m. TimeWarner Cable(Ch. 56)/Cablevision(Ch. 17)RCN(Ch. 83)Verizon(Ch. 34). You can watch the shows on YouTube Episode I here; Episode II at this link. Jane Jacobs Night At Judson Memorial Church Tuesday, September 22nd, 7 p.m. Readings and musings by those inspired by the defender of neighborhoods – MC’d by Rev. Billy Talen and Savitri D! Tuesday, September 22nd * 7pm to 9 PM with Afterparty to follow! Why? 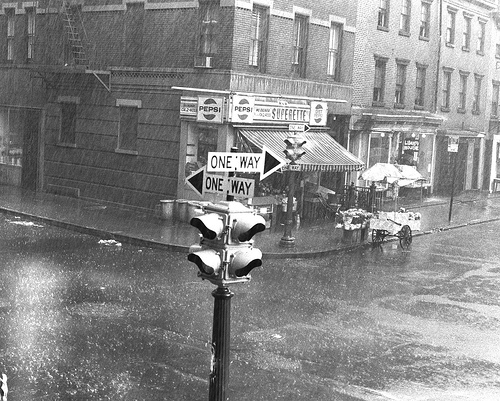 : After a street in the Village was named Jane Jacobs Way –and the presiding city official of the ceremony was Christine Quinn– we learned a lesson. The legacy of our heroes will be appropriated by our opponents as a matter of strategy. The letter to Saving Coney Island by Ned Jacobs, Jane’s son, urging resistance to the Bloomberg-and-Quinn backed highrises of Coney – underscores the need to hold our values in the face of sophisticated public relations spin. What: Jane Jacobs Night. Activists and authors read excerpts from “Death and Life of Great American Cities” and correspondence that Ms. Jacobs sent in support of neighborhood-saving campaigns over the years. We celebrate Jane Jacobs Night to share the personal impact that she has had on our campaigns to save neighborhood diversity here in the city. Free. Donations encouraged for space rental. 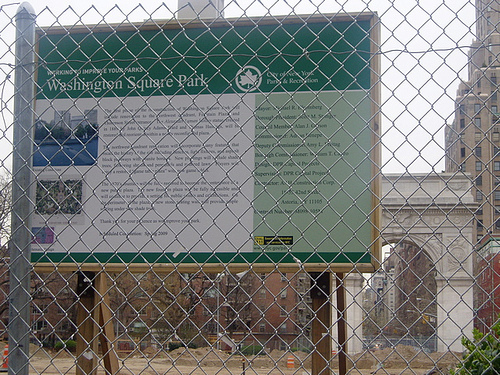 More on Jane Jacobs (one of my first blog entries) and Washington Square Park here.